Andy_Warhol is a Legacy Library. Legacy libraries are the personal libraries of famous readers, entered by LibraryThing members from the Legacy Libraries group. » Andy Warhol's legacy profile. Andy_Warhol is also an author. 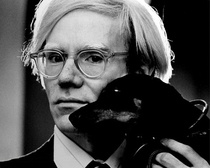 » See Andy Warhol's author page. About meAndy Warhol (1928-1987) was an American artist who was a leading figure in the visual art movement known as pop art. About my libraryAndy Warhol's possessions were sold at auction by Sotheby's on April 24-May 3, 1988. The information about his library comes from volume 2 of the six-volume catalog. Over 1200 volumes were were included in the auction, but fewer than 150 are described individually in the catalog. Those are the volumes which are cataloged in this library.